Patrick arrives at Oasis in search of answers. He finds an unexpected love instead…with Zack, a guy who has plenty of secrets of his own. While he struggles to figure out Zack’s evasive behavior, Patrick becomes the target of shifters who plan to use the newcomer in an evil revenge scheme. Long ago resigning himself to a nomadic life in the desert, where he can’t hurt anyone in his werewolf form, Zack Jaeger is unprepared for the passions the newcomer stirs in him. Yet the more he pulls away, the deeper Patrick immerses himself in Oasis’s most dangerous and deadly secrets. Soon it’s up to Zack to rescue Patrick and explain his true feelings before time runs out and the full moon rises. Wild Oasis was a good read but Savage Oasis was great!!! 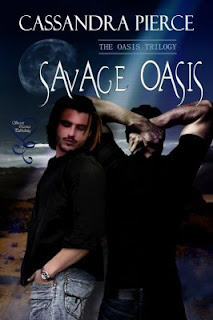 You didn’t read Wild Oasis – shame on you (Jonathan is sooo sweet) but it’s OK because you really don’t have to read them in order. Sorry Tyra but it IS true. In fact now that I think about it – if you don’t read it in order it just would make this book better because you will be just as confused as Patrick. Everyone in Oasis has a secret and they act more than a little weird. Patrick has no idea what the hell is going on and if you didn’t read the first book you won’t either which would really keep you turning the pages. Excellent writing by the way Ms. Cassandra J!!! I knew what to expect and I was still turning the pages like a mad woman. Now if you read the blurb you may think this is just a normal – what everyone else writes shifter book! But – NO this isn’t the case. Secret Cravings new what they were doing when they scarfed this book up. This isn’t your normal happy – cuddly shifter book. This is more of a - don’t know what is out in the desert - OMG crazy people - don’t infect me – hold your breath and turn the page quick -shifter book. So… Patrick leaves home to try and find his brother. Felix isn’t at home (if you read the first book you know where he is) and Patrick lands up wondering into their local bar where he does not fit in and the mystery begins. Not to worry, Zack comes to his rescue and they have a connection from the beginning. It’s a book well worth reading. Patrick’s innocence is so refreshing and he is determined to stay and rekindle the relationship he has with his brother. He learns real quick that Oasis isn’t safe and that the only time he feels safe is with Zack Jaeger. Zack doesn’t want to be with Patrick until he is ready to share all of his and the town’s secrets but he just can’t resist Patrick. I loved this book and if you are looking for a little mystery – family drama – and sweet innocent love then you need to pick this book up. 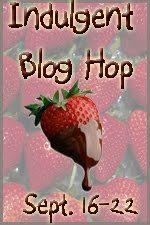 I am giving Savage Oasis 4 chocolate dipped strawberries! Thank you Secret Cravings for your support during our anniversary week. You are awesome!!!!!!!!!! And…don’t forget to enter for your chance at today’s prize. 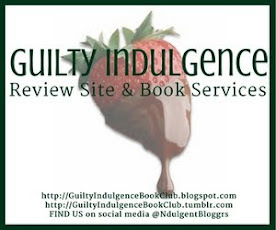 To enter to win our prizes, go to the BLOG HOPS TAB at http://guiltyindulgencebookclub.blogspot.com/p/blog-hops.html. You will also find the full list of hop participants. Clicking on those links will bring you to over 70 sites with a total of over 100 prizes! You've got all week... be sure to check out all the sites! RATING: 4 Chocolate-Dipped Strawberries This book was given to us by Secret Cravings Publishing. Many thanks. Hey! Glad you liked it! Book three is in production right now!! Hope you like that one too! !